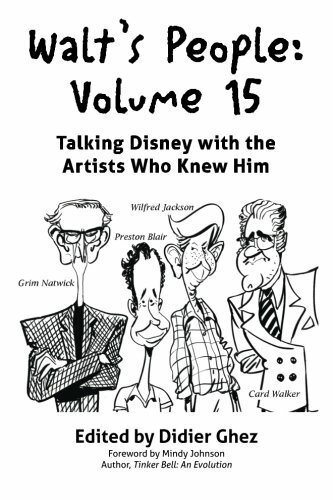 With each volume in his monumental Walt’s People series, Didier Ghez reshapes and invigorates Disney history by presenting his latest crop of conversations with Disney artists and animators both familiar and unknown. Each conversation unlocks new stories, new memories, and sometimes new controversies about the Disney Studio, the Disney theme parks, and of course, Walt himself. You don’t need to be a Disney scholar to enjoy these glimpses into Disney’s past. You’ll find Walt’s people charming, down to earth, and even bawdy at times. Above all else, they know how to tell stories, and they know stories that you’ve never heard before. BILL EVANS explains how he used his green thumb for decades to design and cultivate the beautiful, diverse displays of plants, trees, and flowers without which Disneyland and Walt Disney World would be just so much concrete. BOB COOK provides insight into the little-known world of Disney sound engineer, a role he filled from his first day with the Disney Studio in 1930 through his retirement over forty years later in 1971. BASIL REYNOLDS, in unforgettably whimsical fashion, relates how he got his start as an artist under a pair of Victorian-era, Dickensian characters in London and then went on to draw gags and strips for Disney’s English comics. MIKE PERAZA went to work for Disney during its period of transition from Walt to corporate honchos like Michael Eisner. He recalls what it was like to be an animator in a studio that was changing what it meant to be an animator. And twenty more! Nothing beats Disney stories told by the people who lived them, in their own words. Get your Disney fix from the source!